Mangêt is a stunning community of single-family homes and townhomes in Marietta, Georgia. Within walking distance of Marietta Square, residents have easy access to local shopping and dining. Interstate 75 and 285 are also nearby for residents to enjoy all the attractions in metro Atlanta. With beautiful home elevations, tree-lined streets, and professionally landscaped green space throughout, Mangêt has quickly become one of the most sought-after neighborhoods in Cobb County. We are excited to announce two new developments coming soon to Mangêt. The first is a collection of 3 to 4 bedroom townhomes. These new townhomes feature The Aveline, The Lyon, The Marseille, and The Toulouse floor plans. Priced from the $400’s, these townhomes will be a gorgeous addition to this charming neighborhood. The second upcoming development is the City of Marietta’s Joe Kirby Park. The 3-acre park will be located in Mangêt between Fraiser Street, Manget Street, and Lakewood Drive. The first phase of Kirby Park will feature a walking trail, covered bridge, as well as a bocce court. Recently named Atlanta’s best town square, Marietta Square has a lot to offer residents of Cobb County. Here you will find a variety of retailers including antique stores, boutique shops, and more. Similarly, you will enjoy local restaurants featuring all of your favorite food, such as Cajun cuisine, barbeque, and southern comfort food just to name a few. Year-round you can also head to the square on Saturdays from 9 am to noon for the Marietta Square Farmers Market. There you can shop for local produce and herbs in addition to live garden plants. 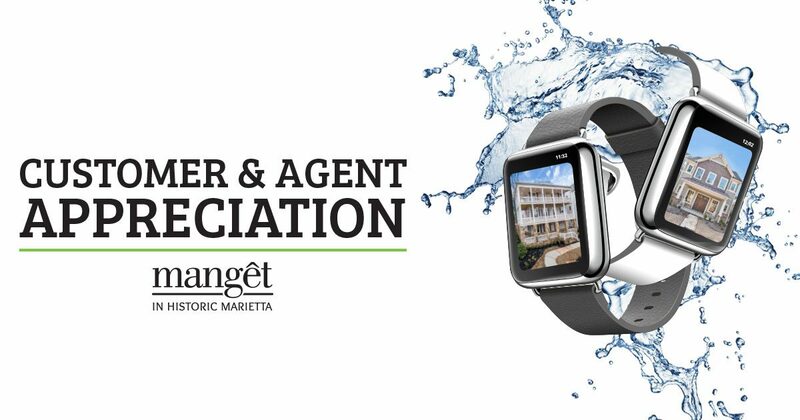 We invite you to join us at Mangêt on Tuesday, March 27th for our Customer and Agent Appreciation event. At the event, you can participate in a scavenger hunt for your chance to win an Apple Watch. We will also be serving grilled hamburgers and hotdogs for lunch. For more information, you can contact our local Onsite Sales Agent, Tommy Garner, at 803-261-6957, or RSVP here. We look forward to seeing you there!